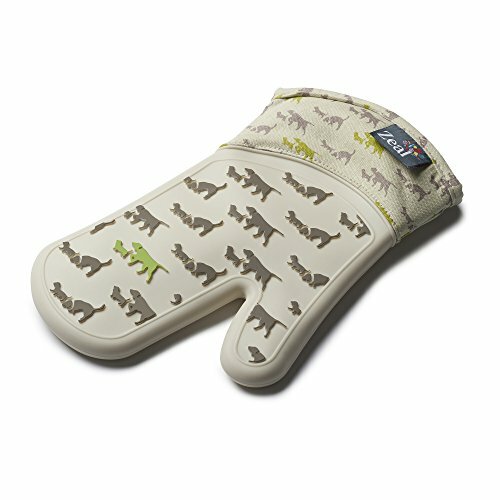 Zeal's Steam Stop Waterproof Oven Glove is the best oven mitt to have in your kitchen. The dog pattern makes it perfect for animal lovers, whether it's for you or as a gift for someone special. The 100% premium silicone is heat resistant to 482F (250C), providing protection against heat, and the quilted cloth interior is ultra comfortable. The silicone portion of the glove features a raised dog pattern that provides a non-slip grip, allowing you to remove a batch of fresh baked cookies, serve hot dishes directly from oven-to-table, or grab hot potatoes right off the grill with ease. Fits both right or left hands! The glove is stain resistant and easy to clean in the sink or washing machine. Kitchen Innovations has put all of their knowledge and experience into spreading the joy of cooking with the Zeal brand - developing innovative products that bring efficiency, ease and fun into your kitchen. For People who love cooking as much as we do. Accent your kitchen with Zeal!